More than half a dozen blockchain-based video startups are promising to disrupt the OTT video market with even more decentralized peer-to-peer distribution. Some startups have pushed the limits, by replacing the entire video delivery chain — from rights management, to production, distribution, and monetization — and created their own ecosystem. 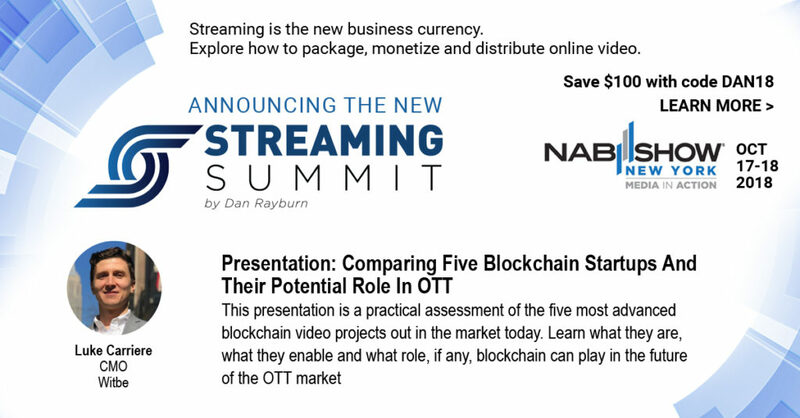 At the Streaming Summit, taking place as part of the NAB Show New York on Oct. 17-18th, Luke Carriere, CMO at Witbe, will present a practical assessment of the five most advanced blockchain video projects out in the market today. Learn what they are, what they enable and what role, if any, blockchain can play in the future of the OTT market.